Release pricing over time is interesting, especially when compared to the spot price of Arabica coffee as traded on the NYMEX. As you can see below, the direction of prices per pound are opposites, with Stumptown increasing gradually from March 2011 thru August 2012 and the spot price of coffee falling over that same period. The opposite price trends highlight what Third Wave Coffee is all about, the decommoditization of the coffee. 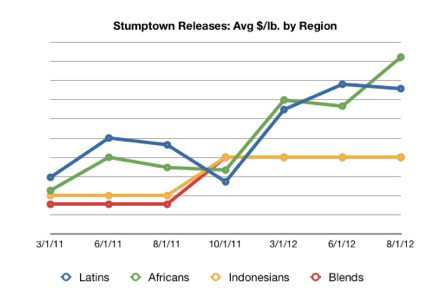 Stumptown Coffee is not just coffee as the price increases in a period of coffee prices declines demonstrates. We'll that's all for now.